Make sure all ingredients are at room temperature (i.e. take them out of the refrigerator for a time being). In a medium bowl, make the crust by mixing together the ingredients (crumbled Oreos, sugar, and melted butter). A kinda doughy mixture should form and press it into the bottom of a 9 inch round baking pan. In a microwave (e.g. Panasonic 1200 Watt Sensor Microwave), melt white chocolate chips with half-and-half. Stir until smooth. 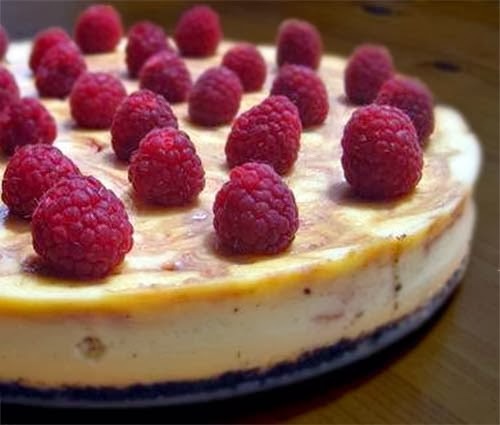 In a large bowl, begin making the cheesecake batter by mixing cream cheese and sugar until smooth. Beat in eggs one at a time. Blend in vanilla and melted white chocolate. Butter the sides of the baking pan to prevent sticking. Pour half of batter over crust. Spoon 3 tablespoons raspberry jam over batter. Pour remaining cheesecake batter into pan, and again spoon 3 more tablespoons raspberry jam over the top. Swirl batter with the tip of a knife to create a marbled effect. Wrap foil around the bottom of the pan and place on a cookie sheet. Fill the cookie sheet with water. Bake for 55 to 60 minutes, or until filling is set. Turn off oven and leave cake inside for an hour. Cool and refrigerate for 8 hours before removing from pan. Serve with raspberries on top for best presentation. Ever tried Oreo cheesecake bites? They're yummy!